Happy holiday weekend for those in the United States. This week is all about traditional foods, family, and friends. Thanksgiving dinner can be tricky to time right, and there sure are a ton of dishes to wash, but there's nothing difficult about any of the dishes. This post includes a photo of my pies and the cranberry sauce, which you may have already seen on Instagram. I didn't take a picture of the turkey, the finished dish I'm sharing, or of the table brimming with food. As usual, I forgot until dinner was almost over. Ooops. I made my usual pumpkin pies, and I always make the whole berry cranberry sauce from the back of the Ocean Spray package. I make dinner rolls with honey in them, which we really use mostly for sandwiches over the weekend. Of course, there's also mashed potatoes and homemade gravy. 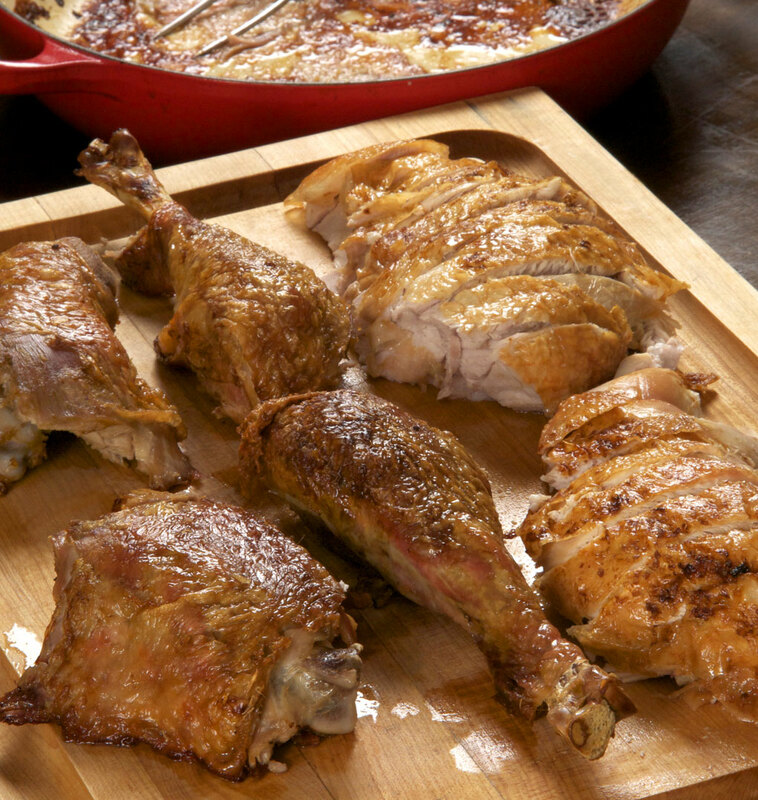 What attracted me to this recipe was that it was for an unstuffed bird (the way I always make my turkey) and the size range was similar to ours. Plus I totally trust Ruhlman when it comes to kitchen advice. We tried a cider bourbon drink to start off the afternoon/evening. We used cider we bought from a local fruit farm, which we warmed in the microwave and then added bourbon, Cointreau, thyme, and a lemon wedge. It was good, but not good enough to share the recipe. One new dish that I'll definitely make again, especially in the summer, came from the Good Housekeeping site and is by Katie Lee (you may remember her from my review of her cookbook Easy Breezy Eats). I liked the idea that I could serve this at room temperature, so I could make it a couple of hours ahead, which freed up stove space. I followed the recipe exactly but after I tossed the beans with the tapenade, I thought the dish needed a spark. I added a good squeeze of lemon, which really completed the flavors. These beans were also good the next day cold as a kind of salad. I think this dish would be fantastic in the summer with garden-fresh beans and served at a cookout or picnic. In a food processor, pulse almonds until finely chopped. Add olives, zest, and parsley. Pulse until finely ground. Add oil and pulse until well blended. Season with salt and pepper. Steam or boil the green beans until crisp-tender, about 4 minutes. Drain and run under cool water to stop the cooking process. Drain again and place in a serving bowl. Every Thanksgiving I vow not to overeat, but alas. It sounds like you had some great food choices at yours! Since it was just the two of us and we worked Thursday, we bought our turkey breast pre-cooked from a friend of ours who just opened a restaurant and made all our sides. I'm all about olives and am marking that green bean recipe - it looks delicious. I was invited to my daughter in law and son for Thanksgiving. I made a black bean and salsa dip for appetizers and an acorn squash salad for the meal.. I didn't over eat and enjoyed the day. Your Thanksgiving looks very traditional. Looks like yours was a good, tasty one. I'd like to try that green beans with tapenade dish myself. We had a fairly quiet meal this year. Great to see everyone had a good Thanksgiving. We skipped out this year — Paris with family — instead of turkey a meal at a Michelin-recommended restaurant (without stars but very very good)! Nice to change what you do once in a while. Your thanksgiving menu sounds delicious, Beth! I’ll catch up on everyone’s blogs when I get back to the US. I'm going to save Ruhlman's turkey recipe for future reference, but I have to ask, do you really take the turkey out of the refrigerator and let it come to room temp for 4 hours? Is that safe? I like the look of that green bean recipe! We haven't had green beans for years at Thanksgiving - we seem to rotate between brussels sprouts, asparagus, and something with kale (along with a green salad). That turkey sounds good, thanks for the link! 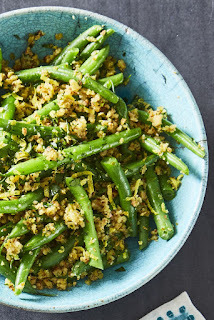 I love the sound of this green bean recipe! We were carting food over to my mom's house instead of hosting, so I made a lot of salad-type sides that can be served at room temperature. Great for a buffet-style dinner, too! I also forgot to take pictures of our Thanksgiving spread! The green bean recipe sounds delicious. The way you prepared the turkey sounds interesting even though I haven't made a turkey in years. I used to brine mine for a few days before. I hope your holiday was lovely. Those green beans are tagged for future times! Thanks for sharing and I miss being part of Weekend Cooking, but as we settle more I to this RV life as Park volunteers, I hope to join the fun again. Thank you.